“Social Media is King”, that’s what you hear. Here I am, a digital marketing agency that pushes the importance of social media when marketing your small business. Guess what? You can’t do it without a website. I can’t express this enough. Not just a website, but an actual functioning, updated, responsive (mobile ready) website. Some of you may even be saying this is a no-brainer and of course you need one. I can’t tell you how many times I meet with clients and they want help with marketing their business but their website has not been touched in 2 years. 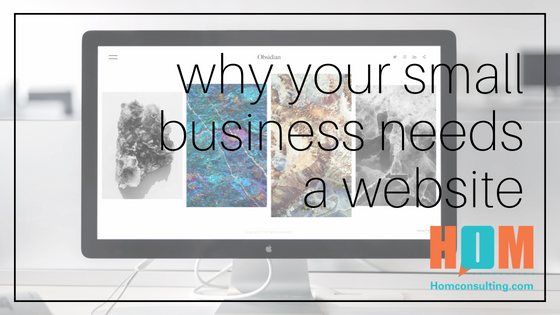 I wanted to touch on a few reasons why your business needs a functioning, up to date website for your small business. Believe it or not, a website is cost effective. The cost that it would take to run ads and billboards to give your business a voice would cost you hand over fist vs. a website. Building a website today is not going to put a dent in your pocket and most platforms are easy enough to keep updated, either on your own or rather inexpensive with a firm. When it’s all said and done, all the efforts and money spent in other areas and not on your site is going to be way more expensive. Show off your products and services. What better way to show off your amazing products or your spectacular services than with a beautiful website. This is probably the biggest reason to have a site. A lot of people use their smartphones and tablets today more than ever. Having your site responsive allows your products and services to be viewed much easier. Most people want to check you out and troll on you before they make a purchase decision. Your website is going to legitimize you. You want to establish trust with your customers and they will look to your online presence, including and starting with a website. It can improve your customer service. Your website allows potential customers or current customers to get more info. They can also ask questions and receive answers from concerns. A website is 24 hours a day in operation. No matter what time of day someone can look you up and gain valuable information on your business without waiting for 9 am on a Monday. A website allows you to continue to share content, just like this blog! Your website is going to be a great place to drive traffic to it from your social media platforms. Sharing blogs, updated products, launches of new services, etc can all be done on your website. Then you get to share that content on your social platforms to drive traffic to your site. 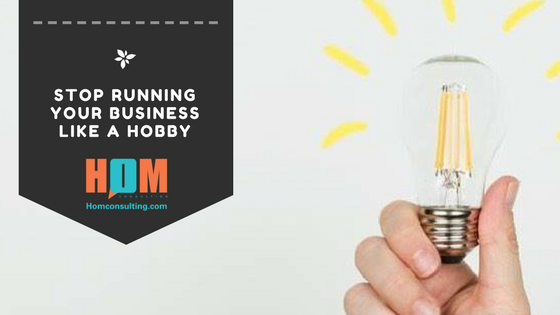 So if you’re thinking about starting a business, you need a site. If you already have a business and have not looked at your site in quite a while, now is the time. It’s super easy to update your site and not the expense it once was to do so. HoM Consulting offers website builds, but we do so because we cannot effectively do our job without a functioning website. We offer website builds FREE when signing on with our Full Digital Marketing Package or we can build you a site for a reasonable price! Don’t wait, summer is a great time to start thinking about this and have it all up and running for the fall and holiday season. What's my website content suppose to be? Well, let me tell you. It should be about storytelling that is customer focused and personalized. There are simple ways you probably have not thought about that can assist you in creating the best content for your website, then in return will give you amazing social content. First, look for a problem you can solve. Once you have honed in on that problem this will give you so many opportunities for you to discuss how you can assist in solving that problem. This is where the storytelling can come in and talk about how you're the solution. This is another key point to assisting with your organic SEO (Search Engine Optimization). People search for problems to look for solutions, so if you talk about those problems you're more likely to be found. The words and content have to live on your site for them to be considered in search results. (Note: Don't solely write for SEO, Google may like you but humans won't). When you're speaking about your solutions you will want to make sure you're doing it with meaningful stories that your customer can relate to. The more you story tell, the better you will become at it. The more you do it, the more your audience will continue to engage with you. Don't think of the "once and done" mentality. You need them to keep coming back. If they aren't a customer today, they can be days, weeks or months from now. This is really important when it comes to B2B or people in the service industry. Did you know your storytelling doesn't have to always be written? Videos, infographics, and even quizzes can really get people coming back for more. Mix it up, if it's the same message delivered in the same fashion we'll get bored! The manner that your content is delivered is all technical, what you may be struggling with is the story itself. Start with an idea. Write 5 ideas down and expand on them. Why would your reader or visitors want to know about this? How is it helping them? You would be surprised once you have the ideas and you start your storytelling it will start flowing. I know the biggest issue I see with my clients is getting started. Just do it. Get started and make it your thing! Email marketing is still an effective piece of any business marketing plan. Having a list of customers, potential customers or fans where you can engage with them directly via their inbox is one of the most impactful ways you can build and cultivate that relationship. Using an email marketing platform is the first step, but getting a good list going and growing can be difficult for any new business. I always tell clients this is the one thing you truly OWN! You own the list. Put effort into the things you can control. Social media is great, but you don’t own Facebook or Instagram. They can make changes to the platform that can leave you out in the cold, but if you have a good list, you’re never gonna lose sight of your customers/fans. I’ve put together some useful ways you can grow that list. You need a sign-up form that’s user-friendly. Yeah, that is simple enough. You have to have a way for them to sign up so you need to create a form within your email marketing platform. This should be very easy and friendly to use. Tip: Don’t make this long. Ask for the information you truly need. They are just getting to know you so they may not trust you completely with a lot of information. Ask your customers. This is especially useful if you’re a retail store. Make it easy for them to give you that info at checkout. Be clear with what they will be receiving by giving you this information. Will you provide information about sales, special offers or useful information they can’t-do without? Make it enticing. Dangle a carrot. People tend to want to give you their email if they know they will receive something right away. Geofencing (Beacon) and Wifi Marketing tools. If you’re a local business there are so many new options with geofencing or wife marketing programs that allow your customers to walk through your door and they can be notified of a special offer or deal via their cell phones. All they have to do is register, which in return is collecting their email address to be added to your database. This is a growing industry and for the right business, this is the way to go. I’ve seen huge returns on these platforms. If you’re offering FREE Wifi within your store make sure you have a place for them to register so that you get that email. Add your email sign up to your social media accounts. Facebook makes this really easy with integrations for most email platforms. Have a call to action on your page. Add a popup to your website. Another really great way to collect those emails. They already are on your website, so they are interested. Now have a popup that offers them something in return for their email. Don’t forget to also have a place to sign up on your site along with the popup. Popup boxes are normally set to show at the designated times you tell it to (first time only, after a minute, never show again, etc) so make sure you have another place on your site for people to sign-up. Promote your newsletter. Share on your social media about how awesome your newsletters are and the information that you share. Let people know what they will receive if they sign up. Events/Tickets – If you have events make it so people must register, regardless if it’s free. If you’re charging for tickets, whatever you’re using to collect monies should also allow you to collect emails. You can import that list at a later date into your email marketing platform. If you have not selected an email marketing platform yet, the above should help you in making a decision. Make sure you pick a platform that can help you with integration, growth, and autoresponders, especially if you’re giving away something for free when someone signs up. Make sure this will be easy for you to manage. Some upfront work, but once done should run smoothly without much interference. You have a lot to say and to share with your customers/fans but you need a way to connect with them.